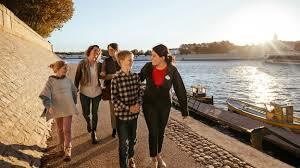 In 2020, Disney Expand will add European river cruise vacations! In 2020, Adventures by Disney will provide new European river cruise sailings, like a brand-new vacation via southern France on the Rhone River. Also, the guided group travel leader will introduce new Short Escape itineraries in Paris, Amsterdam and Budapest, Hungary, which can be booked as pre- or post-cruise stays or simply as separate trips. The prolonged season of Adventures by Disney river cruises have a record-breaking 27 departures next to Danube, Rhine, Seine and Rhone rivers. Sailing with AmaWaterways, a leading luxury river cruise line, these all-inclusive holidays permit visitors to unravel the heart of Europe in an active, immersive and hassle free way. To balance the rising selection of family vacations in 2020, 10 river cruise departures are exclusively kept aside for adults. These sailings meet growing demand among adult travelers for Adventures by Disney’s unique blend of style, variety and adventure in a fun, relaxed ambience. During the new eight-day, seven-night Rhone River itinerary onboard AmaCello, Adventures by Disney guests will navigate through southern France, like the region of Provence, for the first time. Appealing, authentic experiences are the prime features of every port-of-call — stops like Lyon, Tournon, Avignon and Arles, bringing history, culture, illustrious art and distinctive cuisine of this diverse region to life. Active sightseeing adventures like unraveling the charming towns along with villages in bike; kayaking beneath the famous 2,000-year-old Roman aqueduct, Pont du Gard; and taking in the wonderful landscape of the Gorges du Doux by steam train and rail bike.